Not only can you download CodeRage 4 session on materials on Practical XML in Delphi, but below you can also find the chat transcripts below. Note the times are a bit odd: when the chat window refreshes, it sometimes uses the PST time zone, but new posts are using the local time zone. Hence the sudden jump from 9 AM to almost 6 PM. A: Not that Jeroen is aware of. A: Not that Jeroen is aware of. Send Jeroen an email and he will blog about other solutions. A: From Delphi 2010 on – you can use DBX support for JSON! [8:03:59 AM] * Jeroen_Pluimers is wondering why LiveMeeting is always asking for email/company. Does it suffer from Korsakov’s disease? [8:07:34 AM] <Christine_Ellis> It asks because we tell it to. [8:08:22 AM] <Jeroen_Pluimers> but it never remembers, even if you start it with the same session parametes. [8:09:29 AM] <Jeroen_Pluimers> can we do a quick audio test? [8:12:48 AM] <Jeroen_Pluimers> I mean: fro my current Microphone; it works with sound recorder, but wonder if Live Meeting will get it today as well. [8:39:14 AM] <Jeroen_Pluimers> @Peter: that totally depends on what you use to read that XML. The MSXML and Internet Explorer are notorous memory hogs. But .NET is much more efficient on memory usage. [8:41:17 AM] <Jeroen_Pluimers> @Peter: yup, that’s why I mentioned that as the first one. Most of the Win32 users will use MSXML, because that is the default for Win32. [8:43:45 AM] * Jeroen_Pluimers warns: be carefull where you press ESC in IE: it can unload your chat window. [8:48:57 AM] <Jeroen_Pluimers> Scott: let me know later on if I can make it more clear to you. [8:50:27 AM] <Ryan_Ford> Will this presentation be available for download? [8:51:05 AM] <Jeroen_Pluimers> @Ryan: yes it will. [8:52:59 AM] <Jeroen_Pluimers> @Ryan: the session materials are available for download here: https://wiert.wordpress.com/2009/09/09/coderage-4-session-materials-available-for-download/ The replays will be available for download after the conference. [8:58:56 AM] <Jeroen_Pluimers> My VIP room died. [5:45:31 PM] <AbsaLootly> I saw one developer try to put an entire database in one xml file… it took several hours to load it. [5:55:17 PM] <Jim_Ferguson> Can you briefly describe JSON? [5:56:02 PM] <Jim_Ferguson> what tool do you use transcribe your chat? 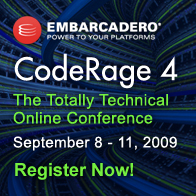 This entry was posted on 2009/09/09 at 18:04	and is filed under .NET, CodeRage, CommandLine, Conferences, Database Development, Debugging, Delphi, Development, Encoding, Event, ISO-8859, ISO8859, Prism, Software Development, Source Code Management, TFS (Team Foundation System), UTF-8, UTF8, Visual Studio and tools, XML, XML/XSD, XSD. You can follow any responses to this entry through the RSS 2.0 feed. You can leave a response, or trackback from your own site.